Over the course of the 1960s, guest workers began staying for longer and longer periods of time. Moreover, many Turkish parents began bringing their children – who had been raised back home by their grandparents – to Germany. It soon became evident that German schools were unprepared for the challenges presented by the so-called second generation. Communication between teachers and students was very difficult, and there were no assistance programs, language classes, or specialized lessons to help these children. Many students failed to meet requirements, and some had to leave even special-needs schools without a diploma. 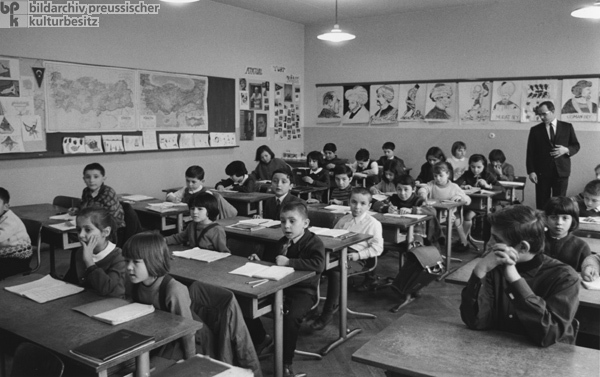 This photo shows a Turkish class at the Elsa-Brandström School in Frankfurt am Main. Photo by Abisag Tüllman.